Labor unions have some tough choices in this election year, as they decide whether to focus on the congressional candidates who align closest with them or help those best positioned to give Republicans the boot. “We recognize that we have to take back one or both chambers to be able to thwart all of the anti-worker measures coming down the pike,” he said. Labor groups, with some notable exceptions, have long put the majority of their political dollars to work for Democratic candidates. 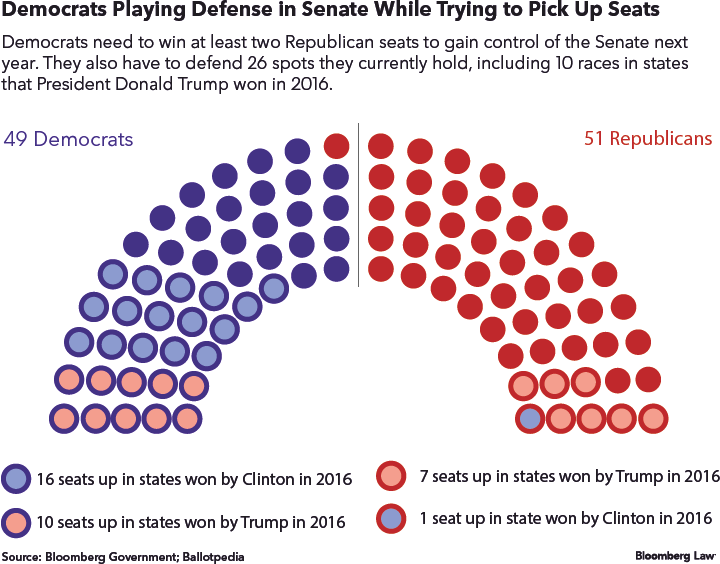 With a tricky Senate map that includes some moderate Democrats running in states that went for President Donald Trump in 2016, several union officials told Bloomberg Law they may move more of that money to candidates who are not completely on the same page when it comes to the issues. 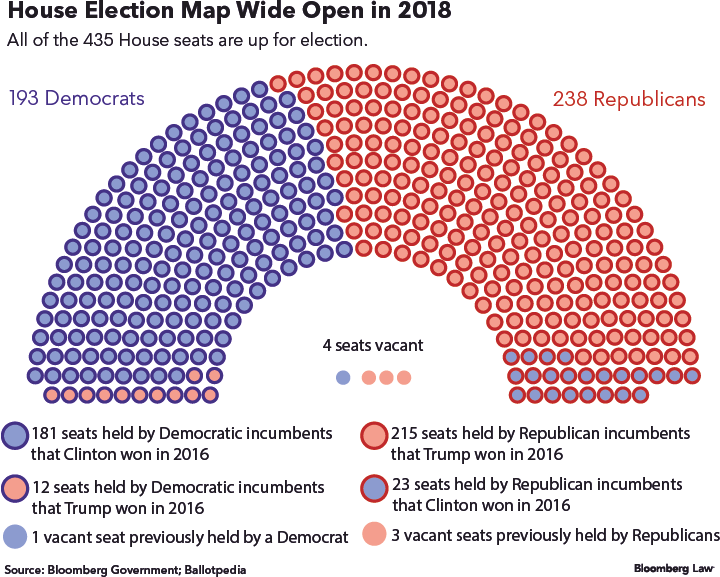 Democrats can win control of the House with a net gain of 24 seats in November. They hold 26 of the 34 seats in play in the Senate, which Republicans currently control by a two-member margin. The midterm election season comes just two years after unions found themselves split over Democratic candidates for the White House and embroiled in a larger debate about the future of the party. Similar spats could loom over decisions about how to allocate resources across the slate of candidates that winds up before voters when they go to the ballot boxes in November. Democrats have plenty of reasons to be confident headed into the November elections, despite an unfavorable map in the Senate and a significant deficit in House seats. That’s thanks to Trump’s flagging approval ratings and an election history that favors the minority party in midterm elections. The stakes are high on both sides of the aisle. If Democrats win control of one or both chambers, they can slow the Trump administration’s agenda on a wide range of policy fronts. That could include determining which bills reach the president’s desk for signature and acting as a gatekeeper on judicial and other nominations. Still, the electoral map shows a tough road ahead for Democrats in the Senate. A total of 10 of the 26 caucus members running for re-election are in states that Trump took two years ago. That’s why some union officials are focusing more on what individual races mean for control of Congress and the various committees in each chamber, instead of on the actual candidate. “A vote for Chuck Schumer is better than a vote for Mitch McConnell,” an official for the American Federation of State, County and Municipal Employees told Bloomberg Law. The official spoke on condition of anonymity, saying that the union has not officially decided on an election strategy. In Indiana and North Dakota, for example, incumbent Democrats Joe Donnelly and Heidi Heitkamp, respectively, are expected to draw strong GOP challengers. Although the senators sided with the AFL-CIO on only one-third of the votes the union deemed “key” in 2016, they can probably still count on significant support from worker organizations. Donnelly (83 percent) and Heitkamp (100 percent)—along with moderate Joe Manchin (100 percent), who is likely to have a tight race on his hands in West Virginia—earned the highest voting scores from traditional union foe the U.S. Chamber of Commerce over the same time. Both lawmakers voted to block the Labor Department’s conflict-of-interest requirements on retirement brokers in the last Congress and Heitkamp favored a measure to fast-track the Trans Pacific Partnership, an Asian trade agreement that labor unions (and Trump) labeled a job killer. Individual unions have their own specific legislative priorities that will also help determine who they support. Organizations representing food workers are focusing on worker safety bills and an agriculture measure that would renew the government food stamps program. UNITE HERE, which represents a number of casino workers across the country, recently told Bloomberg Law that the union will not give money to any lawmaker who voted in favor of a House bill that would limit labor organizing rights in tribal territories. At least a handful of Republicans—like Pete King (N.Y.), Dan Donovan (N.Y.), and Chris Smith (N.J.)—have enjoyed support from some labor groups, particularly building trades, law enforcement, and firefighter unions that tend to lean a little to the right. That’s partly a product of decentralized politics operations that allow local union outfits to decide where to put their money. It’s also an acknowledgment that many rank-and-file union members are Republicans. In an era in which working class voters helped get Trump to the White House, union leaders said they’re spending lots of time listening to members’ concerns and educating workers on issues that could affect their paychecks. Still, big labor is also likely to spend lots of cash trying to get Democrats elected in state and local races. That’s because unions want a seat at the table when those officials start redrawing election maps in 2020. Lawmakers in Wisconsin, Pennsylvania, and North Carolina are already facing legal challenges over districts that critics say are sliced up in a way that favors Republicans. “One of the biggest reasons we are in the predicament we are in right now is because of gerrymandering both at the state and federal level,” the AFSCME official said.